After experiencing the unpleasant realities of a Nigerian police cell, he is rescued by Amaka, a Pam Grier-esque Blaxploitation heroine with a saintly streak. As Collins discovers more of the darker aspects of what makes Lagos tick – including the clandestine trade in organs – he also falls slowly for Amaka. Little do they realize how the body parts business is wrapped up in the power and politics of the city. 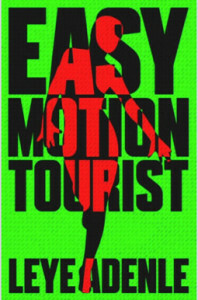 Easy Motion Tourist pulsates with the rhythms of Lagos, reeks of its open drains, and entertains from beginning to end.